Fairfax pattern silverware advertisement by William B. Durgin Co.
William B. Durgin’s silver flatware and serving pieces are today still very much collectible and in demand. During the company’s heyday his Fairfax silver pattern was the leading one in the entire United States. But William Butler Durgin was not born with a silver spoon in his mouth. Though I give credit in the story title to Concord, where he gained his greatest economic success, he was a native of Campton, in Grafton County, New Hampshire. Perhaps the most succinct and entertaining story of William B. Durgin’s life comes from a May 1925 copy of The Granite Monthly magazine. I have quoted excerpts of the story in italics, while adding my own editorial additions, followed by photographs and details generally not found in his official biographies. Likeness of William Butler Durgin from Genealogical and Family History of the State of New Hampshire, Volume 2, published 1908, pp 759-761. His parents were disappointed at his distaste for farming and rather reluctantly allowed him to go to Boston as he wished to learn the jewelers’ trade. As the result of this decision to leave the farm William B. Durgin gave to New Hampshire its only silver industry, the Durgin plant in Concord, home of the famous Fairfax silver pattern, which for fifteen years has been the leading silverware pattern in the country. The plant (was later) known as the Durgin division of the Gorham Manufacturing Company. Finding no opening in the jewelers’ trade on his arrival from Boston he decided to become apprentice to Newell Harding, a silversmith of some repute. Durgin cared for his master’s house and did chores about the place. When his apprenticeship was in its second year, Durgin became ill, probably by reason of low altitude and returned to his mountain home, where he soon fully recuperated, and could only be satisfied by completing his apprenticeship, being one of three out of many apprentices to qualify as journeyman. He decided to settle in the capitol city of his native state and in 1853 founded the business in Concord which bears his name…. William B. Durgin Company banner. Probably made for a trade fair or exposition. 34×66. New Hampshire Historical Society Purchase. Used with permission. During these fifty years Durgin combated and overcame many obstacles to which a less determined character would have succumbed. Durgin started with apprentices, one of whom is carried on the payroll today (1925) William Jones Green, a native of Plymouth, N.H. [William J. Green was born 26 Jan 1848, son of Henry C. & Judith (Crosby) Green. William died 13 January 1925 in Concord NH. Another apprentice-employee was August Bernard Anshelm, whose silversmith set was donated to the New Hampshire Historical Society. He was born in 6 Nov 1875 in Cambridge MA, son of Johannes/John H. & Marie (Abi) Anshelm. August married 3 October 1908 in Pittsfield NH to Florence Elgie Harvey, daughter of John T. & Elgie E. (Fernald) Harvey]. The goal which Durgin fixed was the production of wares in sterling silver, popularly called solid silver. A sore temptation to defeat his object came from a large establishment in Boston offering a magnificent order for plated silver. Durgin resisted and labored all the harder, taking his books home nights, going on the road with his products, and receiving in return whatever of old silver articles were offered, gradually able to enter the Boston market for his wares; and we can picture his pride in selling his products in his adopted city where he learned his trade. Only very recently a silver fork made by Newell Harding was brought to the Durgin plant to be repaired–a pleasant coincidence, and a tribute to the wear of sterling silver. From Boston to New York to Philadelphia and finally to Baltimore was not difficult, after Mr. Durgin had successfully established an outlet for Boston, but it was some time before he was able to employ a traveling salesman…. The Durgin Silverware Factory, photo from White Park, as found in The Granite Monthly magazine cited earlier in this article. A brick building was erected in which the silver business occupied basement and first floor, and from the remaining space Durgin received an annual rental of $2,000. The business, however, gradually encroached until it required an additional story (crowding out previous tenants) and stretched across the street. In 1903 the present commodious plant was begun, and at present writing plans are being considered for further enlargement. Durgin’s Factory Concord, NH, built in 1903 at the corners of White and Washington Streets, (was not the first location) and enlarged several times. This was demolished to build the United Life & Accident Insurance Company building. This is the current site of the UNH Law School. [Editor’s note: The 27 March 1930 edition of the Portsmouth Herald stated, “Concord…United Life and Accident Insurance Company today announced purchase of the unused Durgin silver factory and said the building would be razed to make way for a two-story modern home office building. The factory, which has been empty since its assets were taken over by the Gorham manufacturing company of Providence, R.I. in 1924, is located in a residential section of the city.” This building is currently occupied by the UNH Law School ]. While Durgin flatware in a variety of patterns has for many years commanded a high place wherever known, yet it remained for the wonderful Fairfax flatware, brought out in 1910, to blaze the way for later and successful patterns–Chatham and particularly Colfax. Fairfax has established itself so firmly in the minds of the retail jewelers, backed up by the purchasing public, that its name has been registered in Washington. All patterns in sterling silver flatware have been patented for many years, but probably few names, if any, have been registered. In production of the Fairfax flatware, new processes were introduced in the die cutting, and so successful were these advanced methods that all of Durgin patterns since 1910 have been produced most advantageously. The weight of silver formerly was confused as meaning strength, but in the Fairfax flatware the weight is so distributed that strength has been increased, and gives the sense of the “right feel” in action. This only silver industry in New Hampshire is typical of many industries in the state which started from very small beginnings, but through sheer merit have increased and successfully survived the decrease of the founders. The policy of the present management is to make the Durgin Division an attractive and agreeable place to work–visitors interested in the ramifications of the many necessary processes are welcomed. Rare 1917 photograph of the William B. Durgin factory in Concord NH and employees. This postcard was mailed in 1917 as an order confirmation to a customer. Property of J.W. Brown, Cow Hampshire editor. A few facts may be of interest. The volume of business, upwards of a million dollars annually, comes from outside the state. The sterling silver industry does not in any way deplete the natural resources of the state. The industry employs skilled labor, far above the average. Annual purchases of silver bullion total around one and one-half million ounces. Durgin silver is favorably known throughout the length and breadth of the U.S.A. including Alaska, Hawaiian Islands and the Philippines–a recent large shipment was made to Bermuda. It has been used extensively by the Packard Motor Co., the National Cash Register Company, for the Davis Lawn Tennis Cup, for the State golf tournaments, etc. Photograph of George F. Durgin, son of William B. Durgin and partner in his business. The elegant service for the battleship New Hampshire, made by Durgin is now on exhibition in the Historical Society building at Concord. The State War medal [WWI] was made by Durgin. St. Paul’s School medals have been made by Durgin for years. A photographic print of the interior of a the Durgin Factory metal working shop, including an unidentified worker, taken in Concord, NH, in 1899. New Hampshire Historical Society collection. Used with permission. The Durgin Nutmeg Grater – I recently had the honor of speaking with the author of this web site who helped me locate the photographs of William B. Durgin and his son, shown in this story. He not only knows a great deal about the Durgin silverware factory, but he is an expert when it comes to nutmeg graters. Thankfully a relative, Debbi Wilmes of CT who is publishing a book on the Durgin Genealogy has corrected me on some inaccuracies of the Durgin line that I posted here. I have removed them and will simply say that this Durgin line descended from William Durgin, b 1648 of Oyster River. 1. Varnum Gale Durgin, born 1825 Campton NH, d. 30 June 1887 Thornton, Grafton Co. NH. He married Sarah Morrison Smith, dau of Robert R & Sally Morrison (Keniston) Smith. She was b. 1825 Campton NH and d. 7 May 1898 in Plymouth NH. Children: (1) Oscar L. Durgin, b. 26 May 1850 Thornton NH, died 4 April 1923 in Thornton NH; m. 27 March 1880 Frances Greeley; (2) Varnum Gale Durgin, born 29 March 1861 Thornton NH, d. 22 January 1958; married Mary Ella Foss, dau of Stephen A. & Judith (Morrill) Foss. Had children. Varnum is buried in Blair Cemetery, Campton NH. 2. Susan Foss Durgin, b. 16 Sep 1826, died 11 December 1903 Gardner MA. She married 3 June 1847 to Dr. William Augustus Smith of Campton NH. Child: (1) Frank Wyman Smith, b 1848 Thornton NH, died 2 August 1904 in Gardner MA, m. 16 June 1886 in Thornton NH to Fanny S. Heywood, daughter of Seth & Emily R. Heywood; jeweler. 3. Harrison Durgin, b. 26 January 1828, deacon; glove manufacturer; resided Vineland, New Jersey. He married 1st) 26 January 1851 to Emeline Thornton; He married 2nd) 17 January 1877 in Campton NH to Floretta Maria Taylor of Rumney, NH. 5. Lucinda Durgin, b. 1 January 1835, died at age of 10 days. William Butler Durgin [this story is about him see above], born 29 July 1833 Campton, Grafton Co., NH, son of Francis & Ruth (Butler) Durgin; He died 6 May 1905 in Concord NH at 43 Rumford Street of pneumonia and cystitis. Occupation: silversmith and jeweler from 1853 to 1905. Apprentice in Boston MA 1849-1853. In Concord NH 1853-1905. In partnership with his son, George Francis Durgin, in 1878. In 1905 Durgin became a division of Gorham Silver Manufacturing Co. He has a silverware factory and showcase on School Street and later at the corner of Washington & White Streets Concord NH. Resident of Concord for 51 years. Resided in Boston MA previous to that. He was buried in Blossom Hill Cemetery, Concord NH, on 10 May 1905. He married 21 Sep 1854 in Boston MA to Martha Elizabeth Travers, daughter of George Martin & Martha (Lerned) Travers. She was born 15 January 1833 in Gardner, MA and died in 19 August 1916 in Concord NH. She is buried in Blossom Hill Cemetery, Concord NH (photo of her here). 1. George Francis Durgin [see photograph above] born 25 April 1858 Concord NH, d. 27 May 1905 in Concord NH (21 days after his father’s death); He began working with his father at the age of 20, and became partner in 1878; outdoorsman; He married 6 Feb 1883 in Boston MA to Blanche Harriet Bellows, daughter of Abel Herbert & Julia Antoinette (Warren) Bellows. She was b. 15 Nov 1862 Concord NH and died 8 October 1935 in Concord NH. She married 2d) 15 July 1907 in Boston MA to Herbert H. Wright, son of William P. & Abbey L. (Keyser) Wright. George F. & Blanche H. (Bellows) Durgin had a daughter, Gladys Bellows Durgin, born 3 June 1883 Concord NH. She married 8 June 1908 in Concord NH to Charles Walker Brown, son of Frank E. & Evelyn (Hazelton) Brown. 2. Mary Susan Durgin, born 1 August 1864 and died 24 January 1895; married 6 April 1887 in NH to Richard Henry Rice of Rockland ME, son of Albert S. & Frances (Weston) Rice; resided in MA and R.I. He was born 9 January 1863 in Rockland ME, and d. 10 February 1922 at Lake George, NY; Children: (1) Phyllis Rice, b. 2 April 1889 Boston, Suffolk Co. MA; In 1900 living in Providence RI with her father and stepmother, Alice. (2) Richard Drury Rice, b 29 June 1891 Rhode Island, d. 2 Feb 1922 Montreal, Canada of tuberculosis contracted while serving in WWI; (3) Susan Durgin Rice b 16 January 1895 Providence RI, died 24 January 1895 Providence RI (the same day as her mother). This entry was posted in Genealogy, History and tagged ad, advertisement, B, Butler, Campton, Concord, Durgin, employees, factory, Fairfax, flatware, Hampshire, industry, manufacture, new, New Hampshire, NH, photograph, Silver, silverware, William. Bookmark the permalink. Douglas, thank you for your kind words. It would seem your grandfather was a talented silversmith. If you have a photo of him that you would like to share and have me include here, I would be happy and honored to do so. If not, I felt it important for those who worked at W.B. Durgin’s to be included if I knew of them, as it took many talented hands to produce the silver. I am wondering what kind of illness is created by low altitude. Interesting to contemplate. I also was struck by “low altitude” illness. I’ve heard of HIGH altitude sickness, but what causes low altitude sickness? Too much oxygen? Sounds strange to me! Interesting life, and since I’ve now found relatives who were jewelers in Attleboro, I found this particularly interesting. Happy New Year, Janice! This is utterly fascinating! William B. Durgin is my great-great-great grandfather. (I think I got that right!) My mother’s grandmother was Gladys Bellows Durgin, the daughter of George Francis Durgin, who as you noted, was W.B. Durgin’s son. Thank you for writing up this charming and very personal narrative…I feel closer to my ancestors as a result. 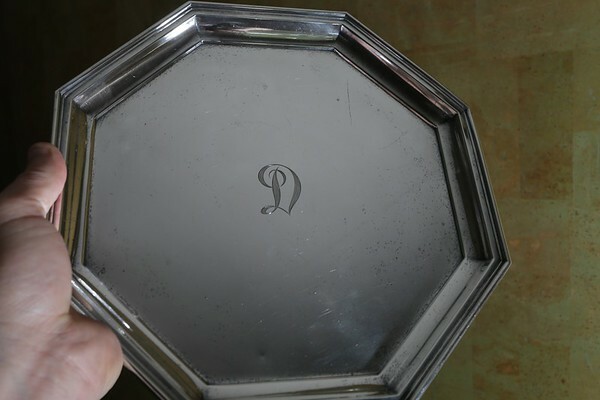 I’m going to try and attach a photo of a silver platter than once belonged to my Great Grandmother…I’ve never seen another like it, and you’ll recognize the script “D”, I think. So glad that the story helped you to reconnect with your ancestors. Your3rd great-grandfather William B. Durgin was a talented man who hired talented people to create the silver objects his company produced. You have many reasons to be proud of him, and your heritage. Thank you for your kind words about the story, as I tried to make it interesting and historically truthful. I don’t do much genealogy. However I was interested in a possible family connection. My grandfather Clark Morrell, from New Hampshire married Gladys Durgin from Saco Maine and in 1960 I inherited part their collection of Durgin sterling engraved with my great-grandmothers initials. Perhaps just common New Hampshire/Maine family names. Clark, I can’t spend a great deal of time on your family research but from what I can see you would be distant cousins to the silver makers. The Durgin silversmiths descend from William-1 Durgin of Oyster River NH through son James, and your Durgin line descends through a different son William. You would need to do the proofs for this but tentatively your line is William-1 Oyster River b 1648 >> William Durgin & Elizabeth Pinder >> Joseph Durgin & Elizabeth Wormwood >> Joseph Durgin & Elizabeth Cotton >> Jacob Durgin & Ann Kennison > Albion L. Durgin & Hanah J. Jeffery > Frank S. Durgin & Minola E. Wormwood > Gladys Helene Durgin & Clark H. Morrell/Morrill. That was appreciated. Like the shoemakers children, I was registrar of vital records in New London Ct for 23 years and never did a search for myself. Now I know why my grandmother wanted to give me all those Durgin spoons…we use some everyday and they look wonderful. Thank you so much. I once wanted to apprentice at Old Newbury Crafters in Amesbury, MA. Must be in my DNA. I’ve sent you an email, Debbi.